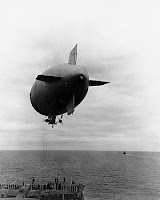 When the U.S. entered WWII, the Navy took over the operation of Goodyear’s five commercial blimps to use them in patrolling for submarines and delivering goods. They were also equipped with two 350 pound bombs. Blimps (or air ships) are nothing more than inflated bags. The East coast base for these unusual flight craft was located in Lakehurst, NJ (the site of the Hindenburg crash), and the West coast base was located on Treasure Island in San Francisco Bay. With one exception, the blimps were used successfully throughout the war; most notably in conjunction with Doolittle’s Raiders. At 6:03 AM on August 16, 1942, the L-8 lifted off from Treasure Island with a two man crew. Normally, flights use three men, but at the last minute the mechanic was ordered to stand down because the craft was too heavy having been coated in moisture from the day’s cool fog. By all accounts, pilot Lt. Ernest DeWitt Cody, and co-pilot Ensign Charles E. Adams were both highly skilled flying airships, so the flight should have gone off without a hitch. 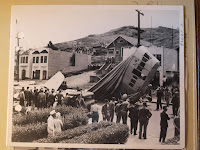 When the blimp crashed onto the golf court on Belleview Avenue in Daly City shortly before noon, both men were missing, and the door to the gondola was latched open. The Navy conducted an extensive search followed by an inquest that raised more questions than answers. The radio was in working order and set to the proper frequency at the time of the crash. If the men were in trouble why didn’t they call for help? The engines were also operating at the time of the crash. The men could have made it back to Treasure Island. Weather was shown not to be a factor, and evidence indicated the blimp had not come in contact with the ocean. There was plenty of weight, including fuel, which could have been jettisoned if there was a problem. The briefcase containing the codes was still locked in place. Procedures called for the men to dump the case into the ocean if they were in trouble. Two of the five water-activated smoke bombs were missing. Had the men found a submarine they somehow fell prey to? The door was latched open, but this could only be done from the outside and certainly not while flying. The Navy’s final determination was that the men had simply fallen out of the gondola. They were listed as missing, and a year later declared dead. My heart goes out to the men’s wives who never learned what really happened to their husbands.